Fukumura Mizuki Yajima Maimi-san. She's nine heads tall?! She's cute, whether she's posing or eating!!! Ikuta Erina Nakanishi Kana-chan. Her skin is fair, her legas are slender, her looks are wonderful. Suzuki Kanon Yajima Maimi-san. Her figure, face, wherever it may be, I think she's number one. Ishida Ayumi Kudo Haruka-chan. Being called the Angel Face, she certainly is cute. Kudo Haruka Yajima Maimi-san. In terms of both beauty and cuteness, she's staggering, I admire her. Also her cool abs!! Oda Sakura Kanazawa Tomoko-chan. It often surprises me just how cute she is! Ogata Haruna Suzuki Airi-san. Since she's got a great figure and a lovely face. Nonaka Miki Nakajima Saki-san. She's stylish and cute...... I admire her! Makino Maria Yajima Maimi-san. She's got a great figure, her face is mature, and she's extremely beautiful. Wada Ayaka Yajima Maimi-san. Since she's really beautiful. Aikawa Maho Hagiwara Mai-san.Her eyes are round and cute. Wada Ayaka-san. She's got the beauty of a goddess. Miyazaki Yuka Uemura Akari-chan. You can't take a bad photo of her. I'd like to let people around the world see her photobook 'AKARI'. Kanazawa Tomoko Uemura Akari-chan. No matter what anyone says, she's a beauty. Takagi Sayuki Uemura Akari. Wherever she appears, she's got a face and figure that's nothing to be embarrassed about. It makes a good contrast with how she is inside. Miyamoto Karin Wada Ayaka-san. Seeing her soothes me. She's perfect down to her very teeth. Uemura Akari Yajima Maimi-san. Because she’s got a great figure as well. Yamaki Risa Yajima Maimi-san and Uemura Akari-chan. I couldn’t narrow it down to a single person, no matter what (laughs). Ozeki Mai I think that everyone's equally number one!! Inoue Rei Everyone in ℃-ute. So the H!P girls think that Maimi's has the best looks in H!P, followed by two of her fellow comrades in ℃-ute. I have to say that Hamachan shows impeccable taste. Even if you take out ReiRei's choice of everyone in ℃-ute, ℃-ute still leads by a huge margin. The ANGERME girls are quite big fans of MaiMai, it seems. The strength of the Wada-Rikako brings ANGERME to the second place. 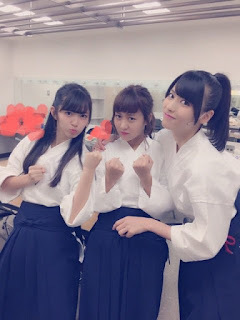 The Juice=Juice girls are quite proud of their Uemuu, with three of them picking her. Morning Musume。´16 was basically Kudo. Country Girls is Momochi, but that's a given.